Kevin Meehan and Drew Langley met in 2001 while working at L’Orangerie, L.A.’s last temple of old-school haute. Both were 23. Meehan had just driven from Long Island to take a position under another little-known newcomer, Ludovic Lefebvre. Langley was an assistant sommelier; the hospitality career that began at an Applebee’s in Maryland had shifted toward wine when he helped sell the nice selection at Greenblatt’s Deli on Sunset, eventually graduating to the cult Napa wineries and the definitive bordeaux collection on L’Orangerie’s list. The pair moved on to the four-star rollout of Bastide under Alain Giraud before landing at the short-lived Citrine. Then after going their separate ways for a decade—Meehan worked for Patina Restaurant Group and Langley became head sommelier at Providence—the two reunited to plan for the January opening of Kali, not far from where Larchmont dead-ends at Melrose. Sitting across from a couple of new apartment buildings and a quick stroll from Paramount, which has fueled a busy lunch crowd, Kali seems as mindful of the past as it is of the present. Outside, horizontal slats of stained wood—the universal symbol of contemporary design—cap a pale brick-and-stucco facade that speaks of eons of varied tenants (a book bindery occupies an adjacent storefront). The moment you walk in, you’re greeted squarely by the bustling white-tiled kitchen behind the expediting pass. Dark stone floors stretch through an airy space with ’60s-style metal and molded-plastic chairs, lots of right angles, and cream walls sporting tufted banquettes the color of café au lait. The bar counter and an antique console support the big silver punch bowls Langley uses to chill the wines (the whites go in the ice; the brambly Central Coast reds rest on it). There’s a classicism to the place to be sure, but the business partners are seasoned enough to know that it’s tricky to come at fine dining head-on today. So they temper the tone with a light touch, down to the muted drum-and-bass music and the name Kali. 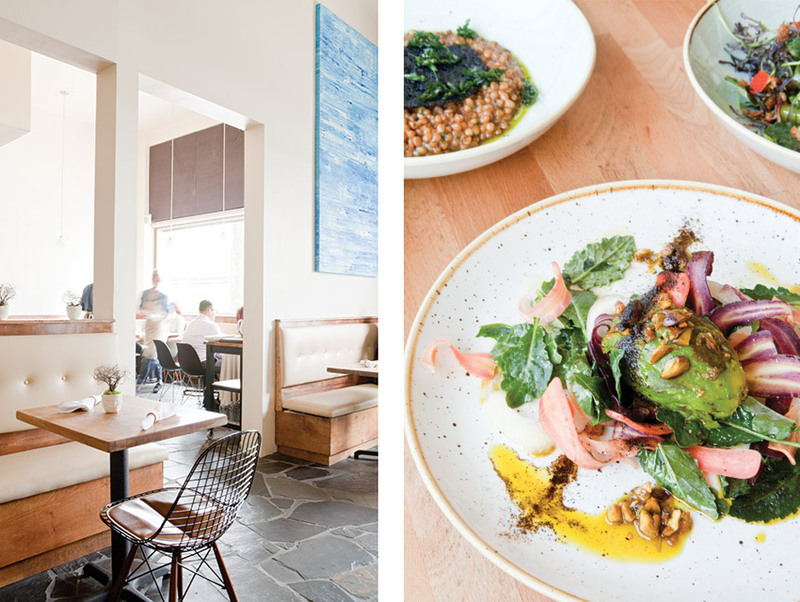 Though it could double as a reference to the Hindu goddess, everything from the potted olive saplings to the Hockney-blue shade of the paintings channel a different source of inspiration: California cuisine. Once a style that drew on French gastronomy but without the white tablecloths, it has been morphing since roasted bell peppers were first tossed with basil at Chez Panisse in the ’70s. However, at its core are the twin engines of extraordinary product and delicate abundance. Their energy surges through Meehan’s cooking, which is conspicuously free of name-dropping. The roasted almonds that lend earthiness to a puck of shredded beets are grown at Fat Uncle Farms, but the only way you’d know is by asking. If the sea urchin orb containing preserved lemon and dehydrated sea lettuce tastes intensely marine, it’s probably because diver Stephanie Mutz ferried it from Santa Barbara in an Igloo container that morning. What’s described as “toasted cheese” atop the rich and toothsome wheat berry risotto is actually a nori-colored disk of Swiss-style farmstead from the San Joaquin Valley’s Fiscalini family. 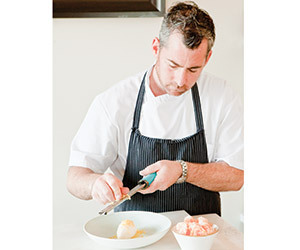 Meehan doesn’t push the allusion to bistro fare—once so central to California cuisine—far. 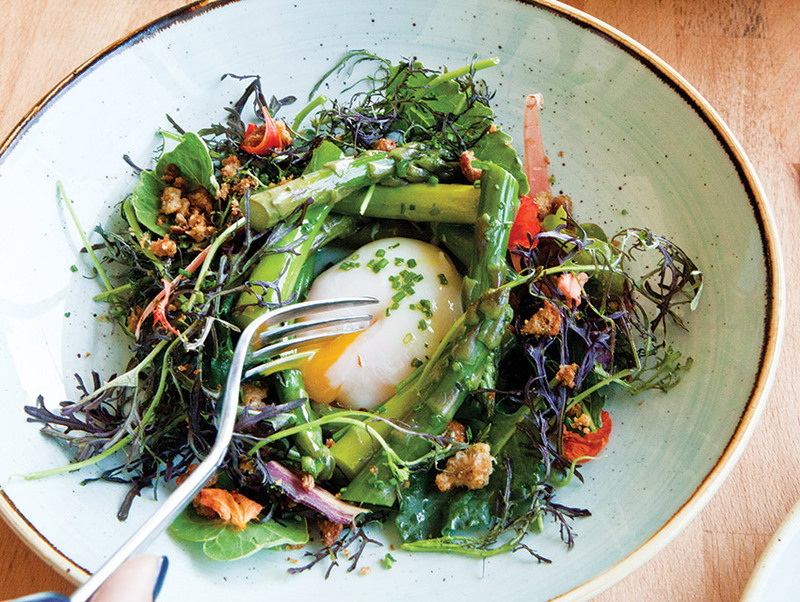 Rather than bacon bits in a frisée aux lardons, he uses crackling duck skin to add texture to a nest of ruby-streaked greens and asparagus tips, a yolk serving as the vinaigrette. But he’s just as careful to soften the more luxurious gambits. Bracing and minerally, the foraged nettle soup is poured tableside but from a matte teapot. The smoked, diced abalone is placed in its own pearlescent shell, more of an after-work treat than an extravagance. The menu, which offers the handy option of ordering first courses in small or larger, shareable sizes, can narrow into instances of exquisite balance. A ribbon of black garlic sauce—the bulbs are cooked in a crock for weeks before steeping in Sparrow Lane champagne vinegar—etches an herbal outline on the steamed sea bass that sits over thyme-braised artichokes and olives. D ESPITE THE years that have passed since Meehan crossed the state line in his VW GTI, he still carries the fascination of an East Coast transplant who tried a Hachiya persimmon for the first time when L’Orangerie was pairing it with foie gras. “What is this?” he remembers thinking, its sweetness seemingly sharpened on the strop of the fruit’s acidity. The same passion is at work in Kali’s avocado salad. Meehan uses the Fuerte, a smooth variety that was supplanted by the pebble-skinned Hass because it could better withstand shipping. He slices the avocado in half, brushing the inside with avocado honey and charring it in a pan. Only when an order comes in does he slip the flesh from its light green casing, tucking between the two halves curlicues of carrots and sprigs of kale and sprinkling the crown with crushed pistachios and herbal ash. Without being diced or slivered, the avocado seems made anew—full and sumptuous and a dish unto itself. Drilling down into an isolated ingredient like that can be risky. Done wrong, the preparation can appear to be a self-conscious exercise. Or just imbalanced. There was seared halibut on the menu for a bit, and I enjoyed how its bright, tangy sauce was crafted from ground almonds and leftover whey from the house-made ricotta. But when combined with the hefty almond crust on the fish, the nut flavor was too strong—a rare case of Meehan seeming more concerned with something conceptual, when his skill lies in using simplicity to highlight ingredients. Rather than cut the seared duck breast into thin petals that can be fanned out, he slices it into thick pieces that, with their layers of fat and crisp skin, look almost like pork belly. Beneath them, unpeeled whole roasted carrots provide a subtle counterpoint. He chooses a similar approach with the Flannery Beef filet mignon, presenting it to great effect over fire-roasted onions—split bulb, stalk, little root hairs and all. Served with fingerling potatoes and a drizzle of bitter herb oil, the dish begs for a fabulous (and fabulously priced) bottle, like a $42 pinot noir from Rajat Parr and Sashi Moorman’s Lompoc Wine Company. Pastry chef Susan Bae does a good job of reflecting Meehan’s philosophy. She makes some gorgeous rolls of milk bread, pillowy as King’s Hawaiian, which arrive unannounced midmeal with house-cultured rosemary butter. Supporting a streusel of crumbled biscotti, her almond milk panna cotta offers a surprising produce-driven variation on the classic, which is tweaked further with a hit of locally made orange sorbet. And she winks at old-school classiness with a tableside dessert. It’s not a pastry cart, or a soufflé rushed from the oven, or flambéed crêpes suzette; rather it’s a quenelle of meringue gelato—actually soft meringue freighted with Straus Family cream—that involves its own drama. The waiter places it before you, a snowy oblong in a white bowl, and quickly reappears holding a long grater and salted, candied yolks cushioned on a folded napkin. In moments they’re transformed into yellow flakes that rain down onto the gelato. It’s salty and sweet, the umami of the dried yolk riding on each bite.